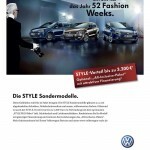 Karl Lagerfeld gives Volkswagen hatchbacks a dose of Style, both the German icons of industry and fashion assemble Style packages for the Volkswagen Polo, Golf and Golf Plus. The vehicles have special touches with alloys, a sunroof, tinted windows, lamp lenses, and speical badges. The vehicles and commercial are only available in Germany.